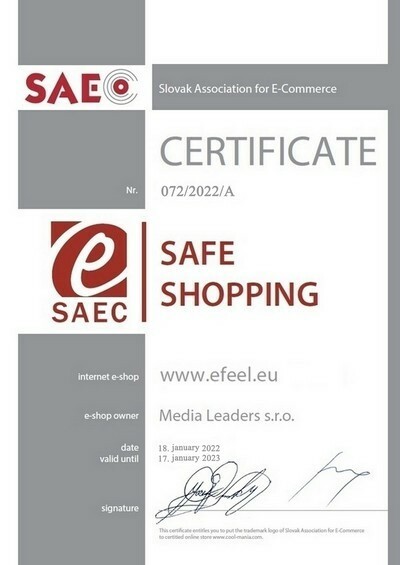 Online e-shop EFEEL obtained the certificate of the mark of quality - SAEC Certificate - Safe shopping as a guarantee of reliability and safety for all its clients and visitors. This e-shop contributes to increasing credibility of the way of product sales through the e-shop in the public eyes. Efeel.eu has become a member of an elite group of online stores not only in Slovakia. The list of certified online e-shops you can see here respectively on the home page of the SLOVAK ASSOCIATION FOR ELECTRONIC SHOP as the highest national authority in the field of electronic trade.